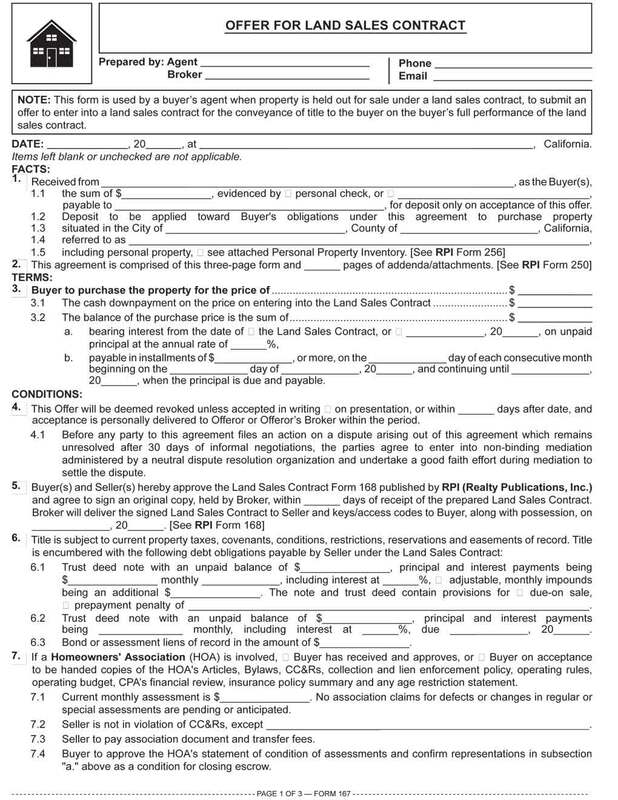 This form is used by a buyer’s agent when property is held out for sale under a land sales contract, to submit an offer to enter into a land sales contract for the conveyance of title to the buyer on the buyer’s full performance of the land sales contract. an all-inclusive note and trust deed (AITD). When you use a land sales contract, it becomes a full – though improper – substitute for escrow’s use of a grant deed, note and trust deed. Thus, the new owner/buyer on taking occupancy does not become the vested owner of record. Instead, the seller retains title as security for payment under the land sales contract. Vested title does not pass to the buyer by grant deed until the buyer pays the seller in full, satisfying the buyer’s obligation under the land sales contract. However, when a seller enters into a land sales contract, an equitable conversion of ownership occurs legally altering the seller’s vested ownership to that of a lien on the buyer’s ownership interest in the property. The buyer’s occupancy gives public notice of the conversion, though the public record typically does not reflect the existence of the land sales contract. However, as straight-forward as the land sales contract may sound, in practice it has proven to be an extremely fragile financial and legal affair for all involved. Other disadvantages exist for buyers who use land sales contracts in lieu of a grant deed, note and trust deed. These negative results include the failure to record the documents used and consequently the loss of the benefit extended to recorded transactions as well as the lack of title insurance to defend the buyer’s ownership. At the very least, a carryback transaction which is intended to be unescrowed, unrecorded and uninsured needs proper documents — a grant deed, note and trust deed as opposed to a land sales contract — to avoid compounding the failure to record and obtain a title insurance policy. Editor’s note — For more on the creative chaos created by land sales contracts, see Land sales contracts pose old risks to new buyers. When a buyer defaults on payments under a land sales contract containing a non-judicial (trustee’s) foreclosure provision, the seller needs to serve the defaulting buyer with a notice of default (NOD) and a debt acceleration notice. California land sales contracts without a non-judicial foreclosure provision need to follow strict judicial foreclosure processes that give defaulting homebuyers time to pay the balance of the price yet unpaid. However, when the buyer does not timely satisfy the entire debt after commencement of a judicial foreclosure sale, the seller (or highest bidder) becomes the owner of the property. In land sales contract foreclosure under the power-of-sale provision, a defaulting buyer may bring all delinquencies current to keep their property. Although California allows land sales contract forfeiture, a defaulting buyer may file a court action and force the seller to foreclose judicially, or simply recover the dollar amount of the equity lost in the forfeiture activity of the seller. Price and terms:The price the buyer offers to pay for the property, cash down payment and the terms for payment of the balance of the purchase price under the land sales contract are set out as TERMS in Section 3. Conditions:The buyer’s confirmation of the physical condition of the property as disclosed prior to acceptance is confirmed by the seller’s delivery of reports, warranty policies, certifications, disclosure statements, an environmental, lead-based paint and earthquake safety booklet, any property operating cost and income statements, and any homeowners’ association (HOA) documents not handed to the buyer prior to entry into the purchase agreement, as well as by the buyer’s initial inspection (personally or by a home inspector) and final inspection at closing to confirm the seller has eliminated defects known, but not disclosed, prior to acceptance, as set out in Section 4.